I LOVE the beach!! 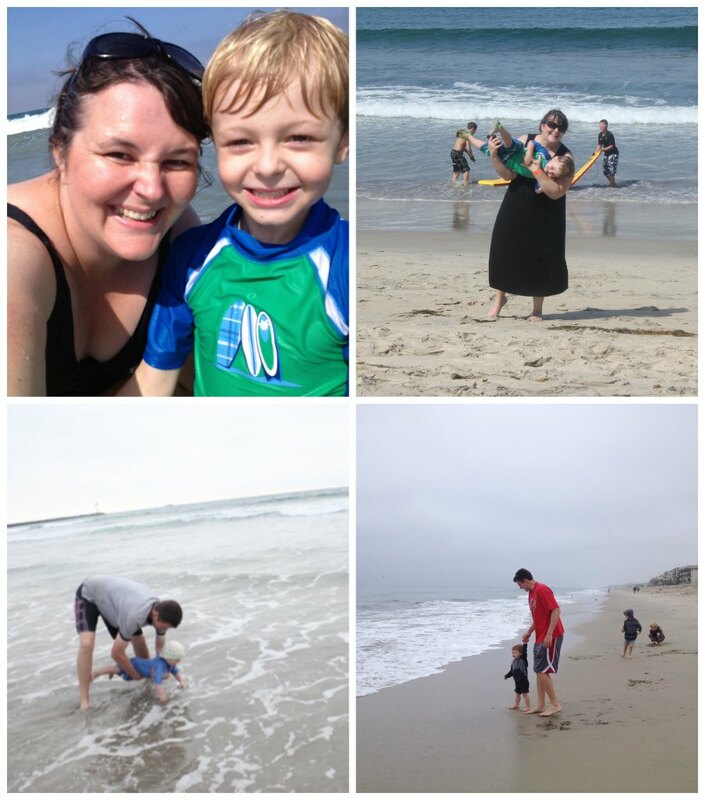 And although we live a good 5-6 hours from the nearest ocean, we’ve now done beach trips with young kids many times. At different points as parents, we’ve experienced beach trips with non-walking babies, young toddlers, preschoolers, and now an early elementary age kiddo. On this most recent trip, the boys were 7, 4, and 23 months – so all still young kids and we had a blast! 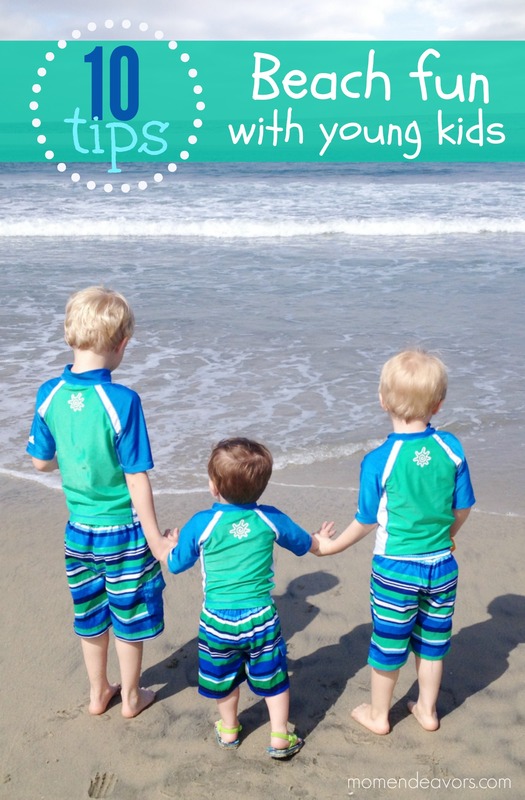 So, here are my top 10 tips for having a great experience on the beach with young kids (*note – some of the links are affiliate links): 1. Safety 1st! No one will have any fun at all if there’s an emergency at the beach. So, being extra vigilant is key. Always verbally communicate with the other adult(s) present as to who is in charge of watching the kids. Do NOT assume that the other person(s) is watching. You may want to set up “home base” closer to a lifeguard tower for an extra layer of protection. Also, remember that the water isn’t the only danger at the beach. Be very careful about the kids playing in and around large sand pits – those sand holes that get dug can fall in people. And, just in case of any little injuries, I like to have a little first aid kit in our bag (with a few band-aids, wipes, etc). 2. Protective Sun Gear- how cute are those boys on the beach? Super cute and SUPER fair! That baby skin can burn SO easily (and after dealing with Baby Brother’s burns earlier this year, I have no desire to deal with burns ever again). So, do NOT forget the sunscreen! Make sure you apply it before you get to the beach AND that you reapply continually while you’re there (the wetskin sunscreen works great for reapplying). 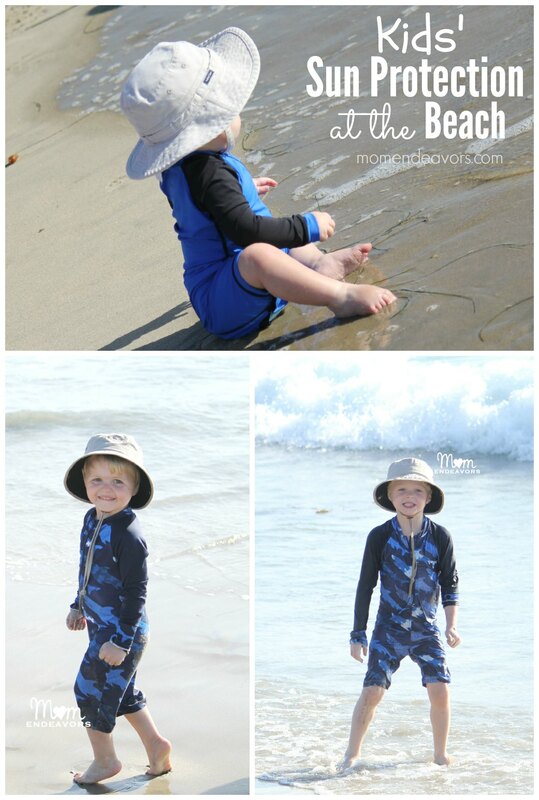 Additionally, we dress the boys in UV Sun Protection swim suits with SPF built right in and we LOVE them. Wearing hats is always a good idea for some extra protection as well. 3. Timing is everything. Take advantage of the kids’ early rise time. Plan a morning at the beach, leaving by lunch time (during the time span that the sun’s rays are strongest). Also, late afternoons/early evenings on the beach (from about 4pm -6pm or so) is a great option and our favorite. The sun is not nearly as intense (so less sunburn risk) and watching the sunset on the beach is always fun! For our latest beach trip, we spent 2-3 hours in the morning on the beach and then we headed back to the hotel. After lunch, some playtime, a much needed nap (everyone slept), we headed back to the beach from about 4:30 – 6:30. A great beach day! 4. 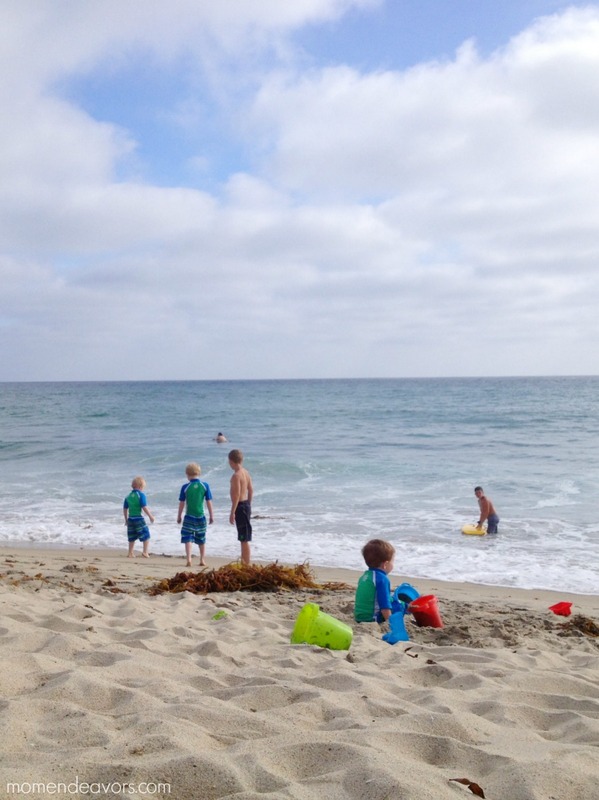 Find a family-friendly beach. Do some research before you hit the beach to find your best family-friendly options. Beaches with lifeguards, some amenities (like restrooms and a place to shower off), and less intense waves are all good things to look for. 5. Set up a shaded family home-base. You need a shady spot (again, sun protection! ), so bringing a beach umbrella is a must! 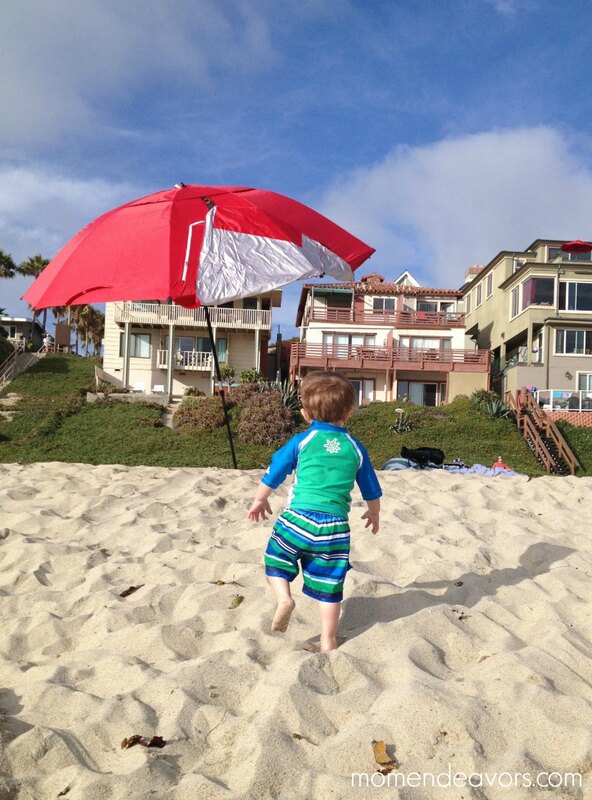 We love our Sport-Brella Umbrella – it’s functional for so many things and great for setting up a spot on the beach. To try to create a sand-free zone (as much as possible), we like to put down a large outdoor blanket. This one from JJ Cole is our favorite! It worked great on our most recent trip – MUCH better than towels! 6. Bring food & drinks. Pack a cooler or insulated tote to be prepared when hunger & thirst strikes. Be sure to have plenty of water (freezing some water bottles ahead of time is always good)! We also like to bring things like juice boxes, fruit pouches (like Dole Squish’ems and GoGoSqueeZ), cheese sticks, fruit, crackers, etc. 7. Pack beach bags. With lots of gear to take, having a good beach bag is always good. Be sure you’ve got it stocked with sunscreen, baby powder (for removing sticky sand), baby wipes, swim diapers, a first aid kit, sunglasses, towels (you could DIY some fun tie-dye towels for the beach), and a camera!! Don’t forget the camera (next time I’m hoping I’ll have a GoPro to try)! As the kids get older, you can make them carry their OWN bag. Wet/dry bags are a great way to go. 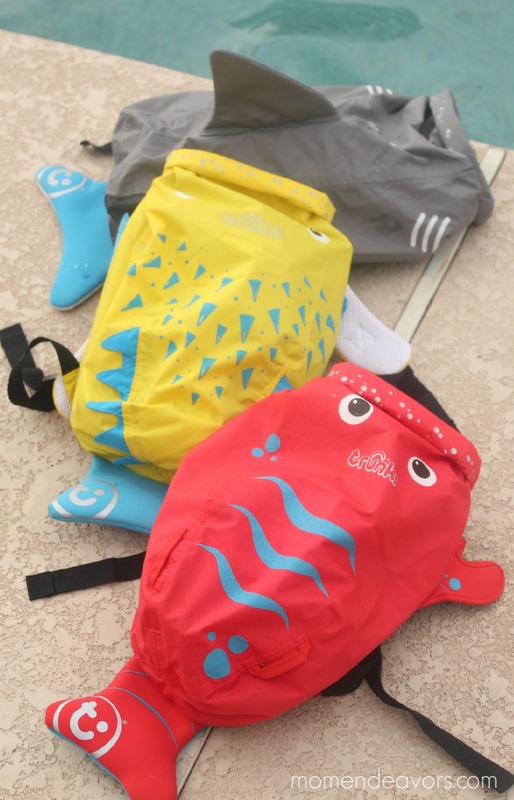 And, we especially love these adorable, water-resistant PaddlePaks! 8. Bring beach toys. There is NO need for anything elaborate. 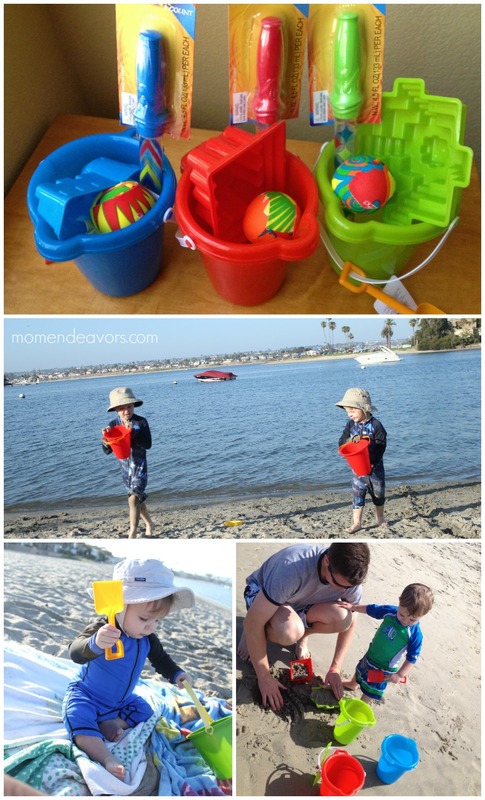 But, since little ones aren’t going to be swimming in the waves, boogie boarding, surfing, etc., a few toys for playing in the sand are always good. The traditional, inexpensive shovels, pails, & molds are great. Other good, inexpensive options are bubbles, splash balls, water guns, etc. 9. Let them explore. The beach is an amazing sensory & educational experience. Even at the youngest of ages, they can discover SO much. Let them get dirty (yes, they might eat sand) and look for creatures. 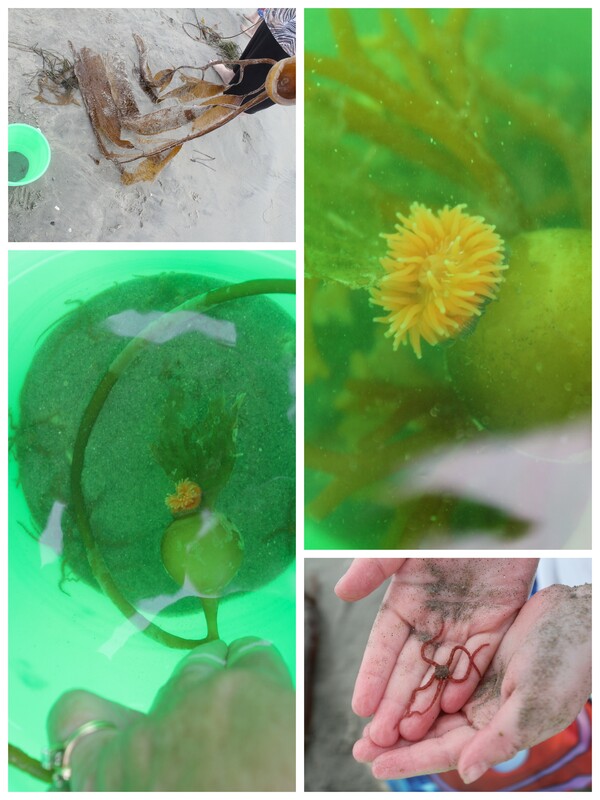 We’ve had so much fun digging for sand crabs and finding creatures like sea anemones & sea stars in the kelp! Check these out: 10. Have fun with them! Be sure to have some fun playing with the kids. Don’t just sit under the umbrella the whole time! Spend some time building sand castles with them, splashing in the water, looking for shells & creatures, laughing together. And, be sure to embrace the camera. Document that you were there too. So, jump in some photos. And, HAVE FUN! What are YOUR best tips for hitting the beach with babies, toddlers, and young kids?